Rebel Recap: Daniella + Addison (New York, NY) — Modern Rebel & Co. Most people don’t move into their dorm room and meet the person they’ll end up marrying, but that’s just what happened for these two rebels on their freshman year of college. Move in day turned into hanging out turned into going out [like, on dates], and soon they were falling for each other while whiskey tasting with their favorite Florida bartender who would end up running the photobooth at their electric love party eight years and a thousand miles later. Meet Daniella + Addison, a couple so grounded in their life together that their love party felt more like a family reunion than anything else; Addison’s dad was the best man, Daniella’s sister the maid of honor, and between these two modern rebels, there were four parent dances that kicked the party off with such infectious energy that the dancing never stopped, only paused when Daniella’s cousins took the stage for a special family band set and the couple stood alone on the dance floor, swaying back and forth to the songs sung just for them. But the best part of it all? In every corner of the Soho winery rock venue turned magical forest full of twinkling lights in the middle of Manhattan were faces smiling so big because this love party was seriously FUN! 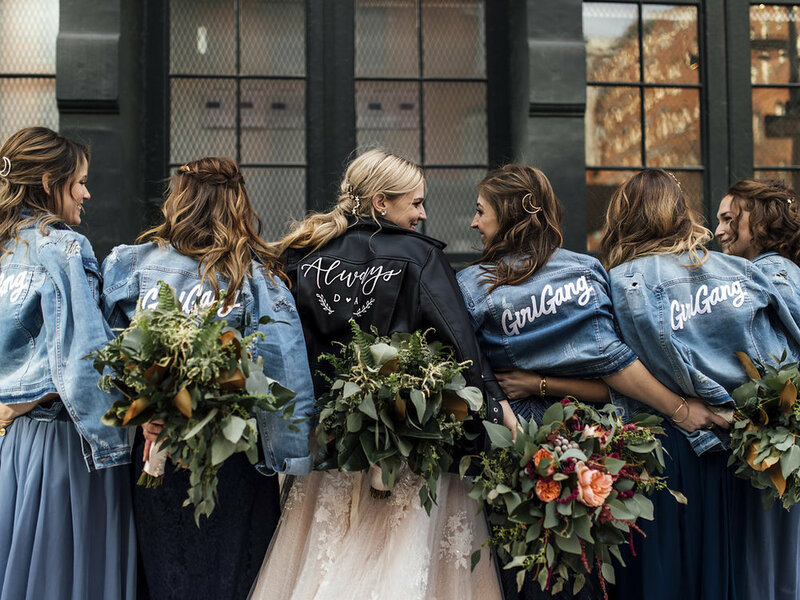 From the moment Daniella and Addison pulled up in an old school taxi cab, bridesmaids waiting on the sidewalk in their embroidered Girl Gang jean jackets, these rebels were ready to celebrate and dance and laugh all night long, because after eight years together, it was about damn time. And at the end of it all, they sat together in a heap on the floor, barefoot and carefree, surrounded by the people they loved most.